Lately I have been making a huge point of cleaning out and purging unwanted items from my apartment. I'm not sure if it's the feeling of a new year and a new start, the idea that we may be able to move out later this year, or maybe the frigid temperatures that are making me stir crazy while I am cooped up here, but I have been making some serious progress. My purging spree continued in the kitchen where I decided it was time to cook with some of the half used items I had around. There's nothing I hate more than throwing away [read: wasting] food, so I've been getting creative in the kitchen to turn these items into delicious meals. Recently, I rummaged through my refrigerator and found a few sprigs of fresh rosemary, chicken broth, and a little bit of white wine and thought it would be the perfect time to revisit an old recipe. I made this chicken in creamy rosemary sauce about a year ago and decided to give it another go, with a few tweaks, of course. 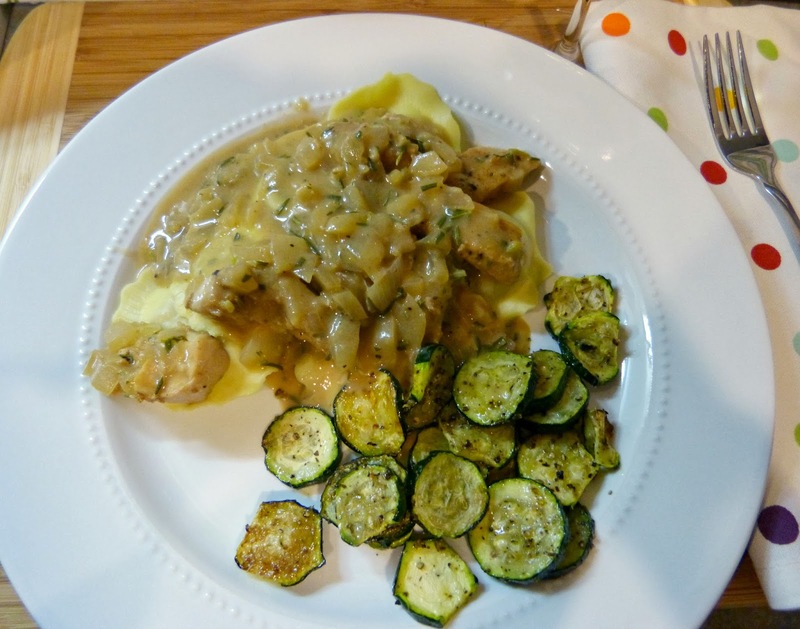 This time around, the chicken is cooked in a sauce that is more pan gravy than cream sauce. It's heavier on the white wine and lighter on the heavy cream so that tangy wine flavor and the woody scent of the rosemary are really the stars here. 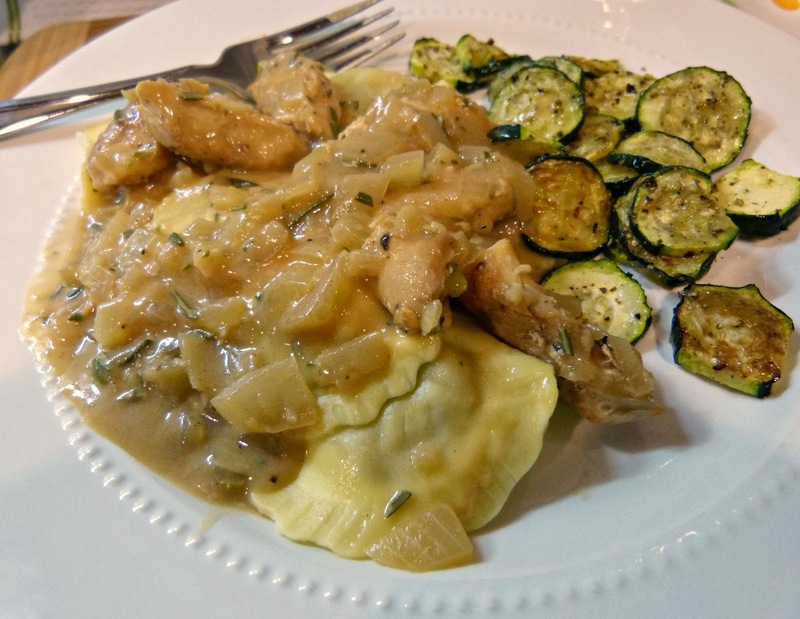 Paired with tender chicken and Giovanni Rana Mushroom Ravioli, this was a delicious and comforting dinner. Melt butter and oil in a skillet over medium-high heat. Swirl to coat. Season chicken breast strips with salt and pepper and add to pan. Saute until browned on all sides. Transfer chicken to a plate and set aside. Add onion to the pan and saute for about 3 minutes until softened, but not browned. Add garlic and cook for 1 more minute. Pour wine and chicken broth into the pan and bring to a boil. Reduce heat and simmer, while scraping up any brown bits in the pan. Continue to simmer for about 10 minutes, until liquid has reduced by about half. Stir in rosemary. In a small bowl, whisk milk and flour together until fully incorporated. Add to the pan, whisking constantly for about 2 minutes. Cook sauce for another 5 minutes, until thickened and season with salt and pepper as needed. Add chicken back to the pan and cook in the sauce until heated through. Spoon chicken and sauce over cooked ravioli and garnish with grated Parmesan.